My father in-law is not a big fan of turkey and makes his love of ham at the holidays well-known. Honestly, I can relate. So we started adding a ham to the family holiday menus about five years ago, but as the host (and cook), I ran into a problem: How can I season and heat a ham while all the side dishes are hogging the oven time? Slow cooker ham is the solution! Spiral-cut ham isn鈥檛 something I鈥檝e always loved. The glaze can be overly sweet, and the texture of the meat can be unpleasantly chewy. This recipe avoids both pitfalls with a custom not-too-sweet glaze and a slow cooker method. The low, slow heat of the slow cooker gently braises the ham, making it the most tender you鈥檒l ever eat. 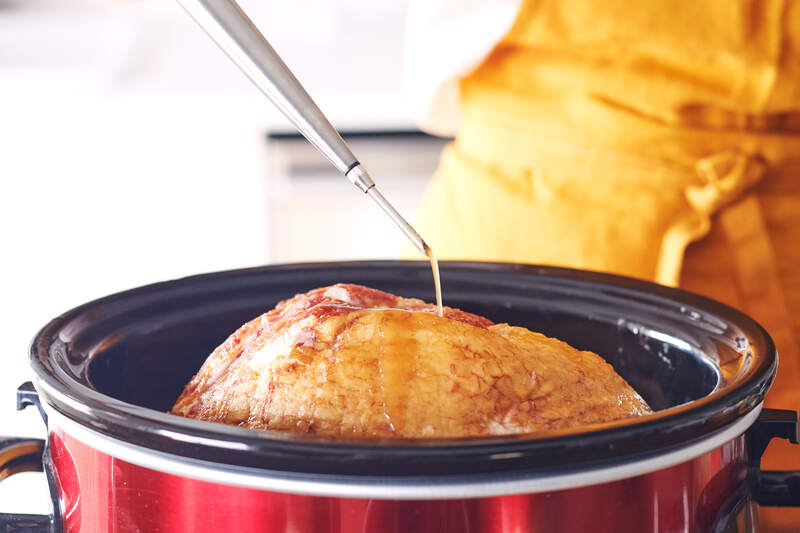 Beyond how much better a slow cooker ham is than an oven-baked ham, cooking the ham in the slow cooker eliminates some of the challenges of serving a ham alongside your holiday roast. Whole spiral-cut hams are most famously known from the Honey Baked Hams brand, but this type of ham can also be found in almost every major grocery store or at your local butcher. City hams, as they are also known, are a leg of pork that鈥檚 cured and sometimes smoked before being cooked and spiral-cut. 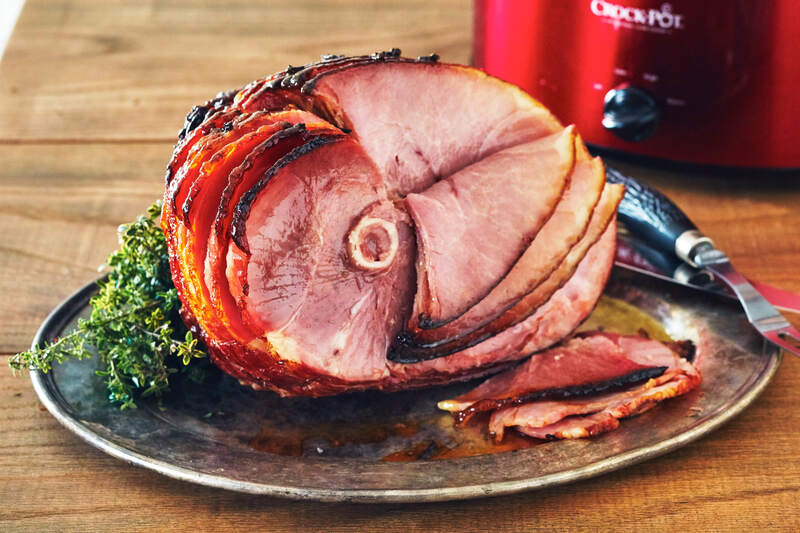 The glaze is an opportunity to add considerable flavor and texture to the ham, so we suggest making your own. 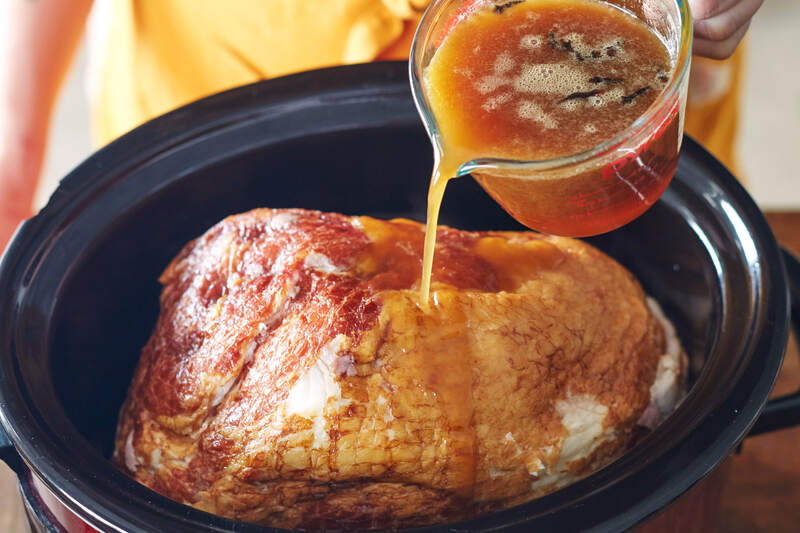 I find a mixture of brown sugar, honey, mustard, and cloves hits all the sweet, warm, and tangy flavors that are familiar and comforting on ham. Plus, these ingredients thicken as they cook, making a sticky-sweet sauce to spoon over the slices when serving. What about the glaze packet? Most fully cooked hams also come with a packet of glaze mix that is essentially brown sugar and spices, which you add water to. There is nothing really wrong with this glaze mix, and you can in fact use it to cook your ham with the following method too. Make the glaze. 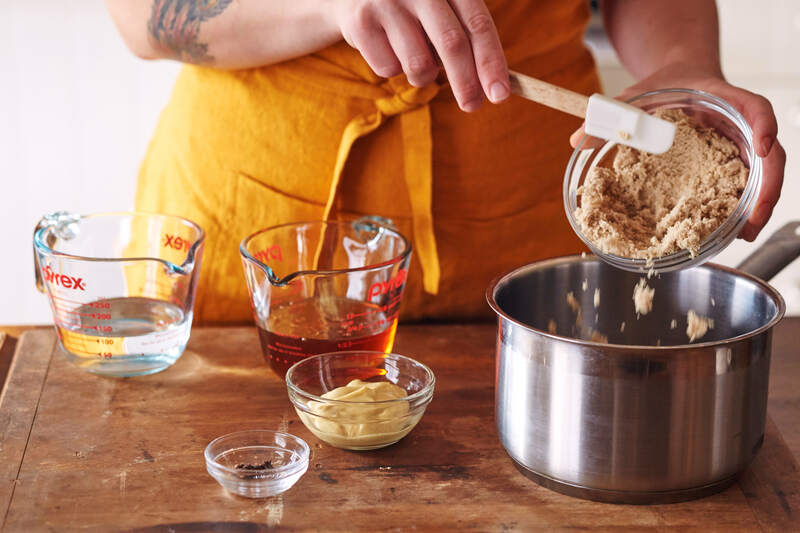 Combine the brown sugar, honey, water, mustard, and cloves in a small saucepan and bring to a simmer over medium-high heat. Cook until the glaze is homogeneous and fragrant from the cloves, about 5 minutes. Remove the cloves with a spoon. Prepare the ham. 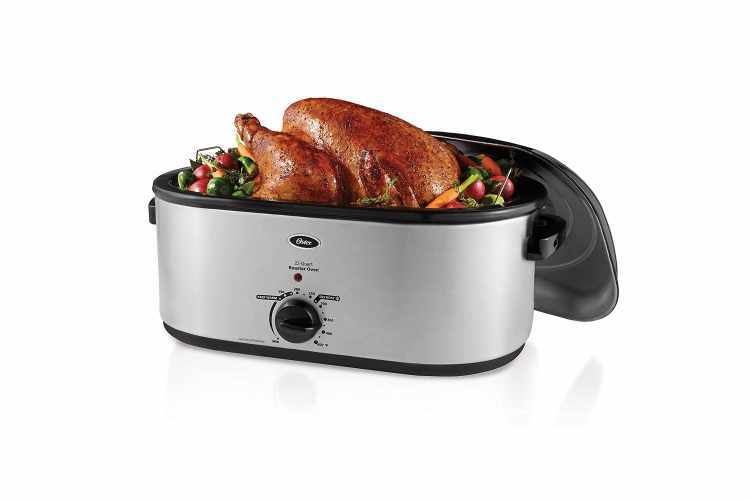 Place the ham in a 6-quart or larger slow cooker, making sure you can put the lid on. You may have to turn the ham on its side, or trim a bit off the top if your ham is too large. Gently pull apart the ham's slices and separate them. Add the glaze. Pour the glaze over the ham, trying to cover as much of the ham as possible, but not worrying too much, as the glaze will fall back into the slow cooker. Cook and baste the ham. Cover and cook on the LOW setting for 4 to 5 hours. Every hour (or as you remember), baste the ham with the glaze. You can also flip the ham halfway through cooking, if desired. The ham is ready when it reaches an internal temperature of 140掳F. Serve with the thickened glaze. Make ahead: The glaze can be made up to 3 days ahead and stored in the refrigerator. 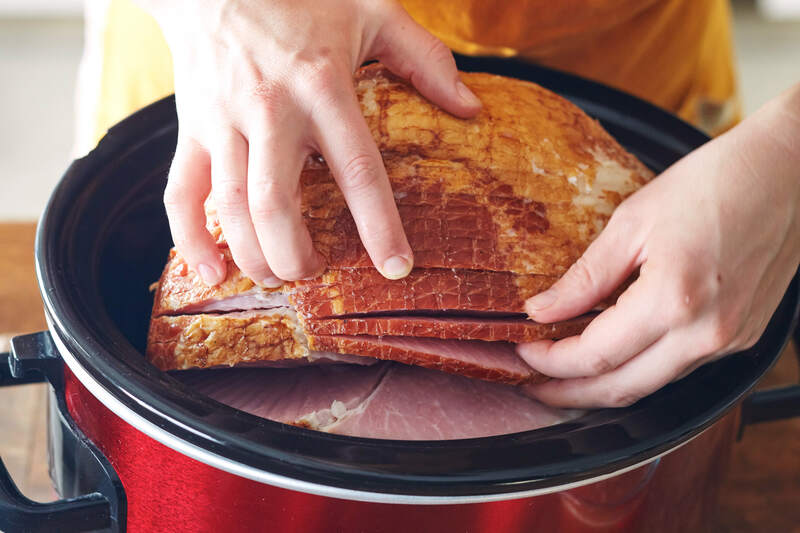 Storage: Store leftover ham in its juices in an airtight container in the refrigerator for up to 5 days.